To those of us who have time to watch morning televison (there are a few out there), Good Morning America's Robin Roberts is a familiar face. Not only does she co-anchor this program, but she was also an accomplished basketball player and a sports commentator. I like her honest, open, and direct approach, even though I hardly ever watch morning television. This, her first book, is not so much about "rules", but more about putting yourself where you should be in order to succeed. Of course you can't just barge in and over everything and everyone, as there are rules in life. Robin's guidelines prove interesting reading and gives hope to us all. One of Robin's "rules" is, "Dream Big, But Focus Small", where she says, "There's a little something called ability that you must have." My sentiments exactly! I've been saying for years that you cannot be anything you want to be. If you don't have the ability or aren't physically suited to that certain something, it's more than likely you'll not succeed. These rules of Robin's reflect her life and ambition and how she got to where she is, and how important playing sports is to all children. 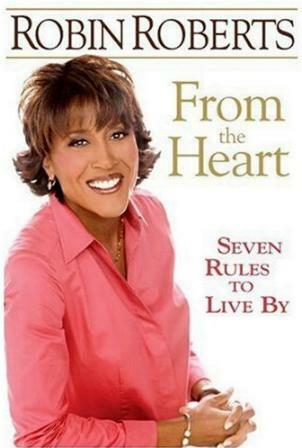 She relates stories of her life, her family, her career, and more, to illustrate her "rules". I loved her moving account of her involvement with the Hurricane Katrina victims. I was also thrilled to hear her parents taught them manners and to speak properly - something so sorely missing nowadays. You just never know what your kids are going to be doing later in life! Conclusion - Inspiring and moving. Lessons for all of us.